Starting out as a suggestion in class, the Drama Club transformed from improvisation and short scenes by an all-girls group in a classroom sixteen years ago to a fifty-member club that found its home on the stage. Our oldest club in the school, Drama has given students an opportunity to enhance their public speaking abilities and not be intimidated by large crowds, to direct small groups in improvisational exercises or large casts in productions, to manage props, work on programs, and assist in costuming and makeup. The success of the Drama Club is due in large part to a supportive atmosphere, which brings out the best in each student. Our students have traveled to the Marin Theater Company, appeared on television, and performed to packed auditoriums. Acting, however, is not the only focus of the Drama Club: each year, the back wall of the stage is adorned with a colorful mural, painted by students. The music from student violinists and pianists echoes throughout the auditorium, showcasing the talent of our musicians, and enlivening the roles of our actors onstage. 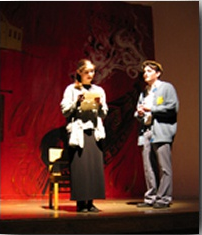 Drama has been the focus of many seniors' college application essays as well as graduation speeches. The gift of public speaking and performance stays with the students long after they graduate. This year in June, the club will perform "The Good Doctor" by Neil Simon.